The Next Web summarizes a series of reports from out of China relating an incident in which a 23-year-old Chinese woman was allegedly electrocuted while answering a call on her iPhone 5 as it was plugged in and charging. Details on the incident are somewhat sketchy, but the woman's family insists that the iPhone was purchased from Apple in December and that the woman was using Apple's official charger at the time of the incident. The South China Morning Post reports that Apple has issued a brief statement expressing its condolences and committing to investigate the situation. According to mainland media reports, Ma Ailun, a 23-year-old flight attendant with China Southern Airlines, was picking up her iPhone 5 to answer a call while the battery was being charged when she was electrocuted and killed. Experts note that any device presents a more risky situation when being used while charging, but that either multiple significant issues between the device and electrical system or environmental factors such as the presence of water would generally be required for a dangerous incident to occur. 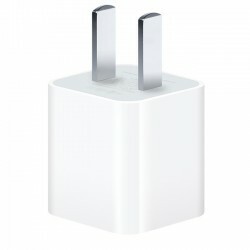 But while the woman's family claims that she was using a genuine Apple charger, the dangers of knockoff chargers are well-known, with many of those devices failing to meet standards for adequately separating electrical input and output. Whilst I'm not gonna say that she was using a 3rd party charger (I would rather stick to facts than speculation) - I just thought I'd share my experience of one. I bought a cheap charger off eBay a couple of years ago. It worked great, then one day I plugged it into the wall, and the other end into my iPod and *bang* - the charger exploded, it shot the charger out of the wall and across the room, charring the wall and blowing the circuit breakers. Luckily there was no fire and no one was hurt, and the iPod was ok (somehow!) but I couldn't help but think that I was lucky and I could have received one nasty shock from that thing. I now buy all official chargers every time, it's just not worth it for the sake of a few pounds. Have some respect, someone has died here. I wish they didn't allow comments on articles like this. EDIT: Apologies to those who've been offended by my comment; I'll admit I wrote this before reading about the lady's death. I can see this happening with one of the Chinese knock-off cube chargers; you should see the insides of those things. The power traces are extremely close together and use shoddy materials. On a side note, as sad as this tragedy is, I'm glad to see the correct use of the term "Electrocuted", too may people say that when they meant to say "shocked". Nobody will ever be able to say "I got electrocuted..." It's not possible. Did you miss the bit where it said she was using an official Apple charger? Ha people are questioning the facts because this happend in China? Racist much? It would be racist to say "chinese people always use knockoff stuff". You could make it even worse by adding "because they're not as good as americans" or something like that. But it is not racist to observe that 99% of knockoffs come from China, and that this happened in China. Therefore, it is possible that these were not genuine parts.